The Medici were a prominent family that produced four popes and two French queens. They controlled the Italian city-state of Florence from 1434 to 1737 and were among the most wealthy and powerful families of Europe during the Renaissance. Florence has been a prosperous city in the Tuscany region of central Italy for centuries. After the fall of the Roman Empire in the west, a number of prominent families took control of the city and often fought wars among themselves. In the 15th century, the leading families of Florence decided they needed a strong person in charge to take charge of their city. 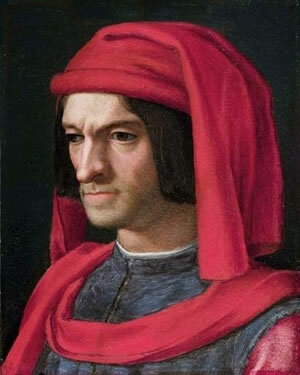 They chose Cosimo de’Medici to take control of the government. 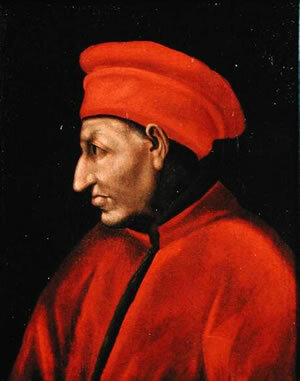 The Medici had been a prominent family in the region for centuries. Their name suggests a relationship with medicine; perhaps an ancestor might have been a doctor. The later Medici were shrewd businessmen whose Medici Bank was the largest and most respected financial institution of the Renaissance. When Cosimo took control of the city, he maintained the appearance of republican government by appointing relatives and people he could control to important positions. And sure enough, when Cosimo died after thirty years in power, his son and grandson continued his policies. Cosimo’s grandson, Lorenzo, was not only a shrewd banker and clever politician; he was also a scholar and a poet. Under Lorenzo’s leadership, Florence became one of the most beautiful and prosperous cities on the Italian peninsula, as well as a center of the Renaissance. The Medici were patrons who funded artists and scientists. Lorenzo was a patron of Leonardo di Vinci. Galileo Galilei tutored several generations of Medici, though the family withdrew their financial support for the scientist when the church charged Galileo with heresy. The last Medici ruler died without an heir in 1737. Florence then came under Austrian and later French control for more than a century. In 1861, the Florence briefly became the capital of the newly unified kingdom of Italy. Present-day metropolitan Florence is the dominant city of Tuscany and home to more than 1,500,000 people. In 1861, the newly united Italian government began a national literacy program to unify a kingdom with many languages and dialects. At the time, the citizens of every major Italian city spoke a different language. Even the new King, Victor Emmanuel, spoke either French, or Piedmont, a dialect of Italian spoken in northwest Italy. Eventually, the leaders of the new nation declared the Tuscan dialect spoken in Florence—not the Latin dialect spoken in Rome—to be “Italian," the national language of Italy.